When you’re on a budget it can be difficult to justify a bit of pampering. Over time however, I’ve found that many kitchen cupboard fillers can be used to make brilliant beauty products for a fraction of the price. Here are some of my favourite ideas which can be adapted to suit you or whatever you happen to have lying around in your cupboard. I always recommend trying a small patch test first and of course don’t add anything in that you know already irritates your skin! This is my favourite homemade beauty product simply because you can make such a variety of things. Mine are usually different every time. I start with a good squirt of my current cleanser as a base and usually add a squeeze of honey and a pinch of salt. The antioxidant and antibacterial qualities of honey give your skin a healthy glow and the salt helps open up your pores and help get rid of excess oil. Depending on your skin type you can add other various ingredients such as coconut oil, or a few drops of tea tree oil, which is great for blemishes. Who doesn’t love a bath bomb?! They’re cheap and easy to make, especially for last-minute gifts! You simply need 2 parts bicarbonate of soda to 1 part citric acid. Citric acid can be bought in most pharmacies and is reasonably priced. Don’t be put off by the name – this isn’t a harmful acid, it’s a natural acid extracted from fruit. Mix your ingredients together and then add drops of water until the mix is damp (like a sandcastle on the beach). You can add anything else you want to the basic mix. A few drops of trusty essential oil will make your bath smell lovely and relaxing. You can also use edible, non-toxic glitter, dried rose petals, oats and bath salts. Once you’ve put everything in that you want, get stuck in and mould the mix! You can use the lid of a deodorant can, an empty cup, silicone baking moulds, whatever does the job. Push the mix in the mould of your choice and then let it set for a few minutes, pop it out, let it dry, and you’re all set for a night of fizzy bathtime relaxation! Good quality body scrub can cost an arm and a leg, but they’re so easy to make at home. Body scrubs help get rid of the dead cells which can make your skin look dull and tired. 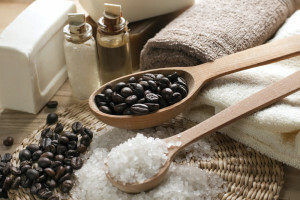 Homemade scrub is far better for the environment than harmful microbeads too. A body scrub usually comprises of two main elements: the exfoliant and the oil. You can use salt, sugar or even oats as your exfoliant and there are a variety of different oils that you can use. If you have a particular fragrance you like you can also add a drop of essential oil. For my scrub, I generally use 1-part coconut oil to 1-part brown sugar. All I do is mix it in a tub and its ready to use! It’s really simple but it works a treat and smells absolutely amazing. Coconut oil retails between £1-£2 per 100ml/mg. If used sparingly it’ll last a fair while. If you don’t want to use coconut oil you can swap this for almond oil, mashed fruit such as banana (yes, honestly), avocado or peach. All of these are high in antioxidant and if something is that good for you inside it must be good for you outside too! Just as a side-note, coconut oil makes for a fantastically nourishing hair mask. Rub it deep into your hair before bed and rinse the next morning for fab-smelling, glossy locks. Apply a tiny amount to the tips of your hair as part of your styling routine. Doing this can reduce split ends or make existing ones look a bit healthier! This last one has saved me from many hair disasters and saved my purse too. If you dye your hair and it goes much darker than expected simply crush 15 vitamin C tablets to a fine powder and mix with a generous dollop of shampoo. Anti-dandruff shampoo works best but normal shampoo will also work. Just wet your hair and then towel dry, lather in the vitamin C shampoo mix and leave on for an hour. You can wrap your head in clingfilm to speed up the process. Then rinse and give a good condition (leave conditioner on overnight if you can) and your colour should lift by a few shades. Dye removal treatments retail at up to £15 so this is a big money saver and very effective! Do you have any homemade beauty tips to share? Tell us all about it in the comments.